Where is the frog? You will have to be very skillful not to lose track of the frog and find it in each of the levels. 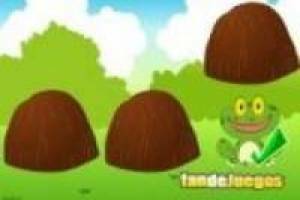 There are three different coconuts and only one of them is the frog. 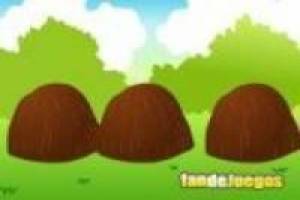 They will show you where it is hiding but when the game starts the coconuts will begin to move quickly so that you lose track. If you are clever enough you will have followed the coconut in which the frog was hiding and you will be able to guess where it is after the movement. At the beginning it may be easy, but when you are moving forward the movement of the coconuts will be more frantic and may be so close that you do not know where the frog is. You have three lives, that means you can only fail three times before losing. Get as far as possible and challenge your friends to improve your final score. 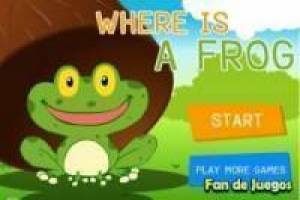 Enjoy the game Where is the frog?, it's free, it's one of our Ability games we've selected.